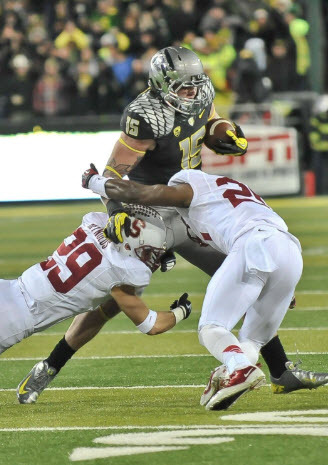 Oregon’s Offensive Transition: Insane or Ingenious? When it comes to Oregon’s offense over the past decade, this is certainly a good philosophy to follow. Under Chip Kelly, Mark Helfrich and Willie Taggart, the Ducks’ offense has been among the most exciting and innovative groups in the country. Apparently, Mario Cristobal didn’t get the memo. 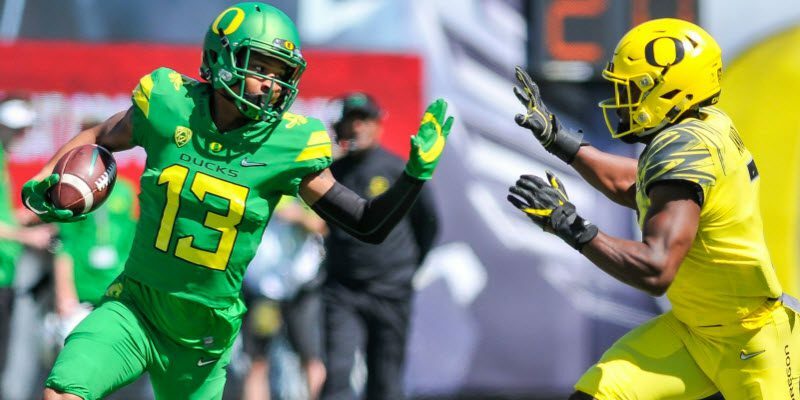 We got our first look at the Ducks under Cristobal this spring, and one thing is very apparent: this unit is going to look a lot different from any of the offenses that we’ve fielded under the previous coaching staffs. Shifting from the foundations of the Kelly/Helfrich offense, or even Taggart’s variation of the spread, is a big risk. Not only were each of these offenses entertaining for the fans, but they were consistently dominant. But what if Cristobal is actually on to something? Is this new version of the Oregon offense capable of being even better than that of years past? It may seem crazy to think so, but Cristobal and Marcus Arroyo’s version of the spread may be the most complete. What Makes the 2018 Offense Different? 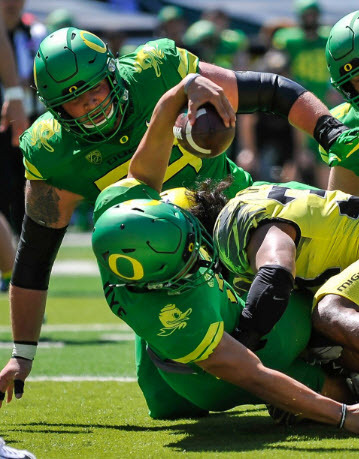 The most obvious takeaway from the spring is that Oregon’s offense under Cristobal is going to be centered around a downhill, physical rushing attack. Featuring a rushing attack is nothing new to Duck fans — a potent run game is as synonymous to the Oregon brand as the Nike swoosh. However, Cristobal’s approach to the run game is different from that of his predecessors. 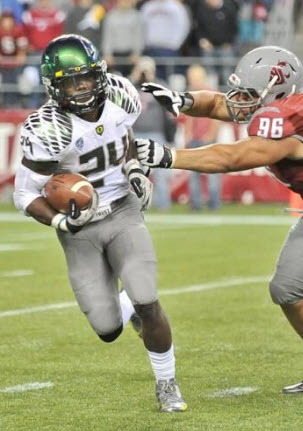 Kenjon Barner shakes off a defender. Under Kelly, Helfrich and even Taggart, the Ducks often relied on gaining a schematic advantage in the run game. Kelly and Helfrich used small, athletic linemen and a myriad of zone read variations to stress defenses both athletically and mentally. 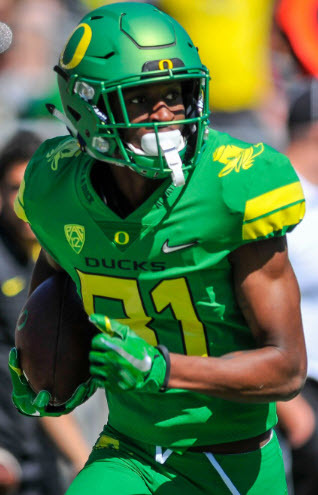 The athleticism of the players, a blistering tempo and supreme execution often caused opposing defenses to over-pursue, which in turn, led to explosive plays for the Ducks. Why run over a defense when the defense could run themselves out of a play? Taggart’s “Gulf Coast Offense” had the same goal, but used different tactics. In his offense, Taggart utilized pre-snap motion, inverted veer action, multiple pulling linemen and that same breakneck tempo to attack defenses horizontally, disorient them and create a numbers advantage. While both of these methods were successful — and they were revolutionary, no doubt — they also had some inherent weaknesses. Stanford shut down the Ducks’ offense in back-to-back seasons under Chip Kelly and Mark Helfrich. Both offenses (the Kelly/Helfrich offense and the Gulf Coast Offense) relied heavily on misdirection and pace, but when either of these advantages were negated, the offense became ordinary. Defenses that had the depth to be able to rotate effectively were able to withstand the barrage of the Oregon tempo, and disciplined units that won at the point of attack completely neutralized the misdirection that so often led to big plays for the Ducks. We all remember our underwhelming performances against Stanford in the early 2010’s, among others. This year, Oregon’s offense will still primarily feature the rushing game, but they won’t be focusing on schematics to gain an advantage. Instead, Cristobal’s main goal is to gain a physical advantage over his opponents. A good defense can overpower a good scheme. When that happens, an offense has to be able to line up and drive the defense backward with sheer physicality. That is the identity of the Cristobal offense: to utilize many of the schemes that made the previous offenses so effective, but to do so with an additional emphasis on brute force. To create this new-look offense, Cristobal changed everything from alignment (the use of the “Pistol” formation allows for straight-ahead, downhill running) to recruiting (the average size of Oregon’s offensive line recruits in 2018 is 6’6, 333 — that’s some serious beef). The culture of the Oregon offense is being redefined. Unlike the previous regimes, this unit is built to punish defenses for loading the box by running over defenders, as opposed to running around them. Travis Dye runs over defenders. Oregon has been labeled a “finesse” team since its rise to prominence. Whether it is an accurate label now or not, it won’t be by the end of this season. What About the “Excitement Factor”? There’s been some fear that this shift is not for the better. However, the added dimensions of size and physicality that we saw this spring make for added versatility, which makes for a better offense. While this offense will certainly look different, it’s still going to be exciting, with plenty of opportunities for explosive plays. During the spring game, I was encouraged to see that there is still a dedication to getting playmakers the ball in space and taking advantage of one-on-one opportunities down the field. Cristobal is still regularly using the jet sweep motion that Taggart popularized, and that allows for elite athletes like wide receiver Jaylon Redd to get on the edge and make use of their supreme talents. You’ll still see a lot of quick screens, too, which will get the ball to our playmakers on the outside and let them do damage. We saw breakout wide receiver Daewood Davis do just that when he took one for a touchdown in the spring game. Daewood Davis showcased his athleticism in the spring game. Additionally, Cristobal and Arroyo’s consistent use of shot plays down the field (a staple of the Gulf Coast Offense) will not only keep defenses from stacking the box, but will also give our receivers opportunities to win in one-on-one situations. Versatility is the name of the game, and if Cristobal has learned anything from his time at Alabama, it’s that an offense needs to have multiple ways to attack defenses in order to win. This offense is being built to run the ball down the throats of opposing defenses and wear them out by sheer physicality, but it also has the ability to win out in space and take advantage of the athleticism that the previous coaching staffs have brought on campus. Stylistically, the 2018 Oregon offense might appear to be turning back the clock, but really, the opposite is true. It will be the ultimate 21st century unit, with the ability to run up the scoreboard in fast-paced shootouts, while also being able to grind out a win in a slugfest when necessary. Take a deep breath, everybody. Change is tough to swallow, especially when changing from something that worked so well. However, it hasn’t worked so well against the best teams, so some form of evolution is needed. If the new Oregon offense is less exciting, but leads to more wins, I’ll take it. I’d rather have a dull win than an exciting loss.